Following three rounds of fan voting, the #NECselfie submission from @lizzzym_ secured the coveted championship title. The winner edged out a submission from @aouellette_ in what was an all-Bryant University championship round of voting. Thanks to all who shared a #NECselfie this March. And, remember, you don’t have to be watching a basketball game to do it; there is never a bad time to stop and snap a #NECselfie. It all comes down to a pair of Bulldogs duking it out to become the “Face of the Northeast Conference” this March. After two rounds of fan voting, only @lizzzym_ and @aouellette remain standing. Now, it’s up to YOU to decide which one claims the coveted 2016 #NECselfie championship crown. Vote for your preferred #NECselfie submission in the head-to-head match-up below. final round voting will be open from 10:00 am until 10:00 pm ET on Friday, March 21. Vote for the top #NECselfie submissions in the head-to-head match-ups below. Semifinal round voting will be open from 9:00 am until 9:00 pm ET on Friday, March 18. The two winners will advance to the final round voting, which will determine the “Face of the Northeast Conference” held. That voting will take place on Monday, March 21. Vote for the top #NECselfie submissions in the head-to-head match-ups below. 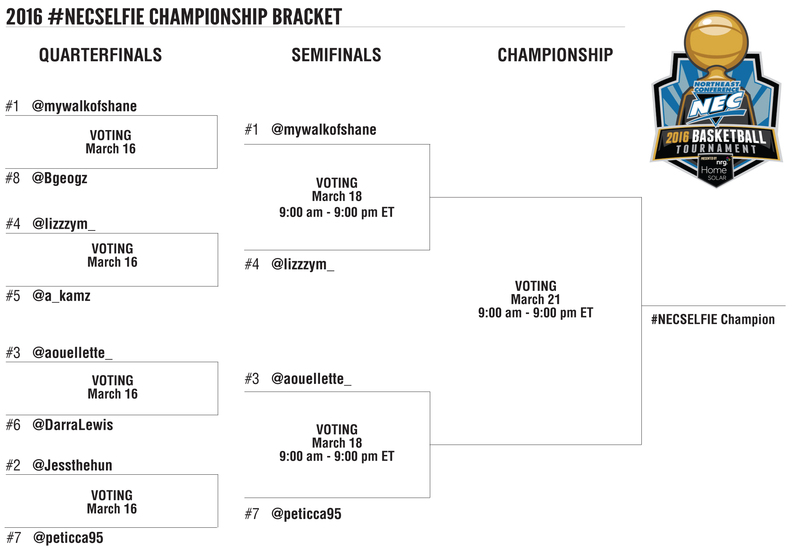 Quarterfinal round voting will be open from 9:00 am until 9:00 pm ET on Wednesday, March 16. The four head-to-head winners will advance to the semifinal round voting, which will be held on Friday, March 18. 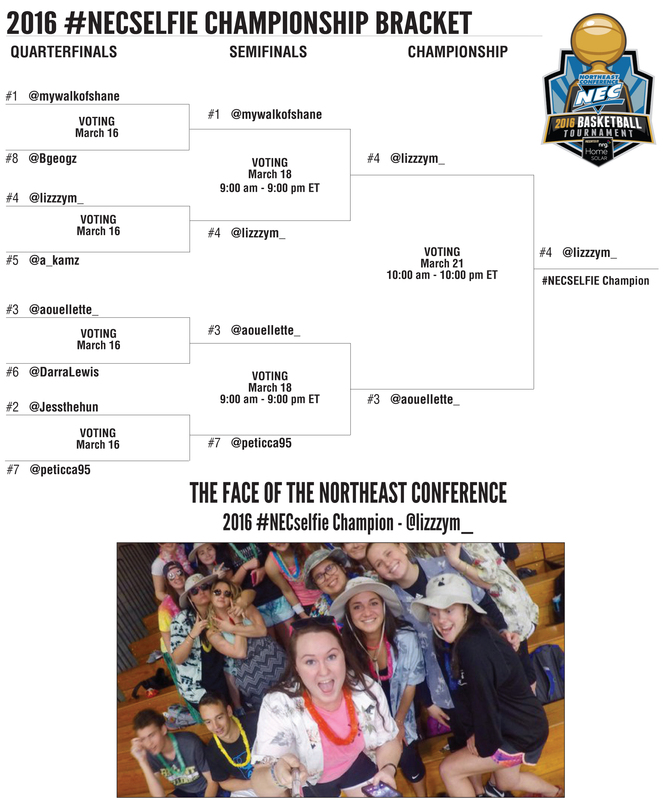 The #NECselfie championship round vote will happen on Monday, March 21. A submission from instagram user @aouellette_ snagged the fifth automatic berth into the #NECselfie Championship Bracket, which will be comprised of eight finalists. Here is the Top 4 from women’s semifinal action on March 9. Three smiling women supporting their beloved Bulldogs in the NEC semifinal round = one great #NECselfie. Add some emjois and hashtags into the equation and we have our preliminary round winner for March 9. Lizzzy’s second #NECselfie submission of the tournament earns the runner-up spot for March 9. Coordinating a selfie with an entire rugby squad is actually a fairleiy impressive feat. Whoever high-jacked the @BryantSAAC twitter handle definitely knows how to dress. Those skit caps are on fleek. A great effort, but the Lizzzy and the Rugby squad along with the SAAC were just a little bit better on this particular night.